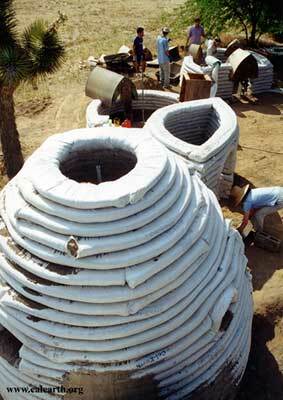 Sandbags, dirt and barbed wire are all that's needed to start building an earthquake proof shelter like this! Build an earthquake proof home within a day! After a fire, hurricane, flood, or earthquake we immediately declare that this was a natural disaster, an act of God. The right question is why did our house burn, fall apart, or get swept away? And when we have the chance to re-build it, why should we build it the same way and in the same place? Ultimately “natural disasters” are human created disasters blamed on nature. 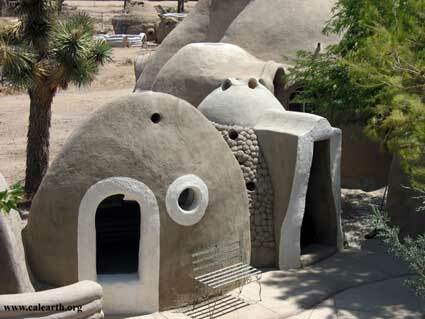 Architect and author Nader Khalili developed this simple breakthrough building technology known as Superadobe (sandbags and barbed wire) and Ceramic Houses, with the freely available material of earth, for almost thirty years. Khalili believes that the whole family should be able to build together, men and women, from grandma to the youngest child. As such, we have spent many years researching hands-on how to make the process simpler and easier. There should be no heavy lifting or backaches, no expensive equipment, and a flexible and fast construction. The bags are filled in place on the wall using small pots like coffee cans, or even kitchen utensils. You can build alone or as a group. The structural principles of the timeless forms of arches, domes, vaults, and apses are built with the materials of earth, sandbags and barbed wire using the engineering of single and double curvature compression shell structures, to reach the ultimate in strength, self-help, and aesthetics. In Superadobe, the ancient earth architecture of the Middle East using sun-dried mud bricks is fused with its portable nomadic culture of fabrics and tensile elements, not just through design and pattern, but through the structure itself. Structural design uses modern engineering concepts like base-isolation and post-tensioning. The innovation of barbed wire adds the tensile element to the traditional earthen structures, creating earthquake resistance despite the earth’s low shear strength. The aerodynamic forms resist hurricanes. The innovation of sandbags adds flood resistance, and easy construction, while the earth itself provides insulation and fire-proofing. how to build these structures to benefit mankind. It’s a proven technology, it’s cost effective, you need very little building material, just what nature gives you. So simple it can be learned by everybody.